The best part about teaming up with those you admire is the opportunity to work shoulder-to-shoulder with your heroes. For those designers with an affinity for type, just saying the words House Industries conjures up images of stylistic fonts with seductive curves and bold personalities—personalities imparted by the team behind the type. House Industries founders, Andy Cruz and Rich Roat met at a local studio in Delaware where they found themselves often collaborating on projects. In 1993 they rolled the dice, struck out on their own, and started a studio called Brand Design Co. They wanted to find a way to let their personal interests—like skateboarding, heavy metal, and hot rods—influence their work, so they created a set of hand-lettered fonts that reflected the grungier, subculture side of design that they loved. Releasing fonts that pushed the envelope was a risky move (and they were pretty sure they would flop) so they put them out under the name “House Industries.” Well, in that one risky move they created a font foundry, and have never looked back. They not only manage collaborations within the studio, but have taken on a number of partnerships with companies and people like Heath Ceramics, the Eames Office, and the Girard Estate. We asked Ken what’s so rewarding about partnering up on these projects. He said, “The best part about teaming up with those you admire is the opportunity to work shoulder-to-shoulder with your heroes. Not only do you get a close and candid glimpse into their process, but you also gain the opportunity to further the legacy and to become a part of it.” We love the idea of companies that embark on a journey together, to create something bigger than they could have individually. 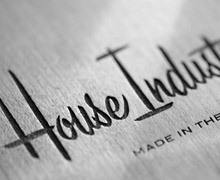 House Industries has gone on to become something of sensation in the design world, and people love them because their work is still such an authentic reflection of their collective passions—whether it’s mid-century sign painting, custom road bikes, or Japanese packaging—they love what they do, and it shows. Check out this short House Trailer that showcases their work in all its hand-drawn, hand-pulled, and hand-inked glory. If you didn’t realize the sheer breadth and range of work that these guys (and girls) have put out over the years, this short film puts it all into perspective. If you missed the recent Photo-Lettering exhibition in California, like us East Coast folks, and you want some large-scale type to dig on, it’s on view on their blog. In fact, we recommend that you just go ahead and add their blog to your daily reading list for a constant stream of visual goodness.